Turkish social media have been circulating images claiming to show a Russian serviceman on a naval vessel passing by Istanbul holding what appears to be a rocket launcher. Ankara has slammed the reported incident as a “provocation”. It is claimed to have taken place in the Bosporus with photos beginning to emerge online last Friday. 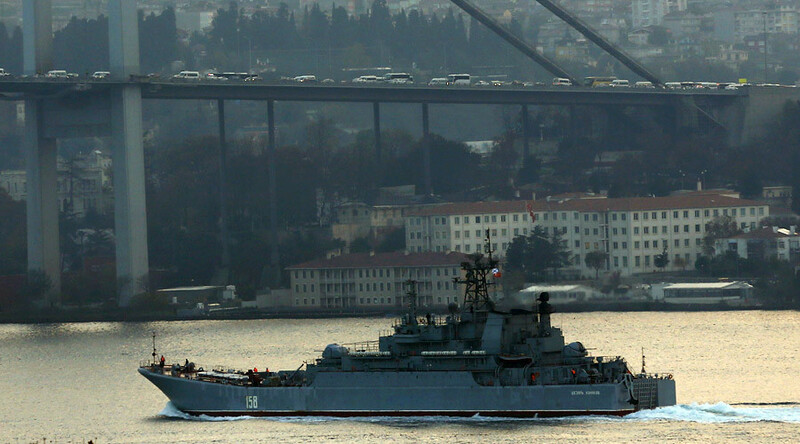 They purportedly show a large Russian landing ship – the Caesar Kunikov – sailing by the Turkish city en route from the Black Sea to the Sea of Marmara. Turkey’s Foreign Ministry has summoned the Russian ambassador over the reported incident, a Turkish official told Reuters. “For a Russian soldier to display a rocket launcher or something similar while passing on a Russian warship is a provocation,” Turkish Foreign Minister Mevlut Cavusoglu told reporters Sunday. “If we perceive a threatening situation, we will give the necessary response,” he added, according to Hurriyet. The Turkish foreign ministry has also warned the Russian ambassador against any repeat of the incident, Reuters reports citing sources. While the Russian military has not commented on the incident, the ship in the pictures does, indeed, look like the Caesar Kunikov. The authenticity of the snaps purporting to show a Russian serviceman with a manpad cannot be independently verified at the moment. It is also unclear whether the ship really did cross the Bosporus in recent days, as the Bosphorus Naval News reported it had passed by Istanbul “on her way to Syria” in late October. In late November it was captured by a Reuters photographer on its way back to the Black Sea. Russian-Turkish relations have deteriorated since a Russian pilot was killed when a Turkish F-16 fighter shot down his Su-24 bomber near the Turkish-Syrian border on November 24. Moscow took a number of measures against Turkey following the incident, including imposing an embargo on some foods, suspending the visa-free travel regime between the two countries, and freezing the Turkish Stream gas pipeline project. Russia has the right to use the Bosporus Strait, as well as the Dardanelles, according to the Montreux Convention of 1936 that grants such rights to all Black Sea powers.